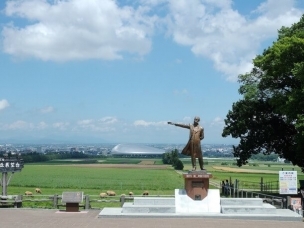 “Yozorano Genghis Khan Susukino Kosatenmae” is a great place to enjoy Genghis Khan and beautiful night view! 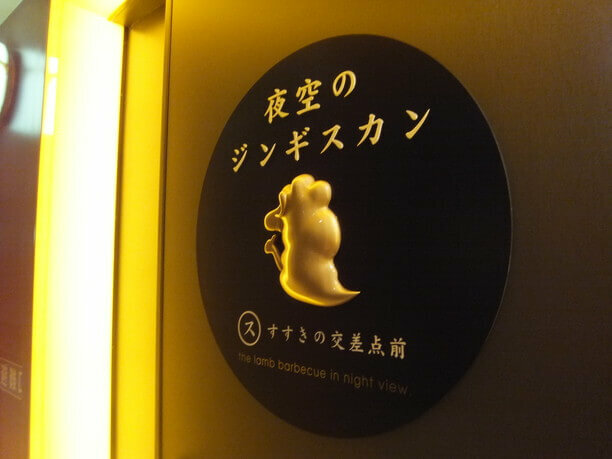 Susukino, Sapporo ‘s entertainment district is marked with a special symbol. 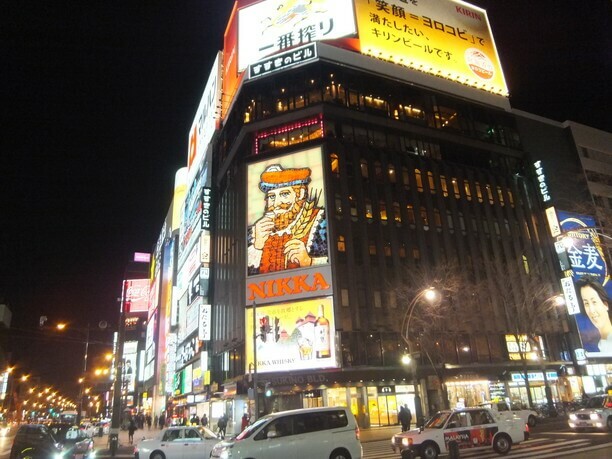 As you look in the night lights you will see a big sign of “Nikka ‘s uncle.” It is here Hokkaido people can eat Genghis Khan, which is considered a soul food by the people of Hokkaido. 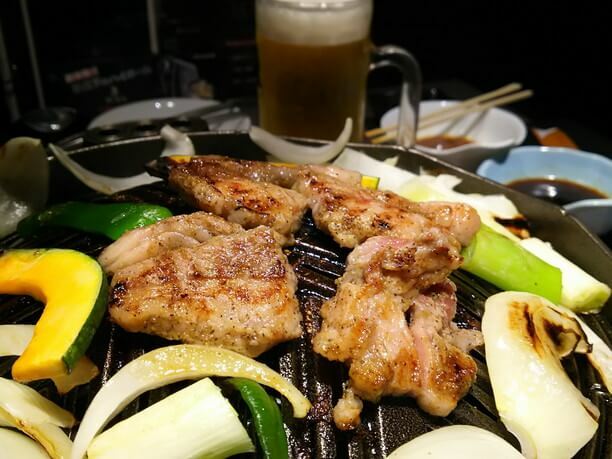 One of the most popular spots to eat is the “Yozorano Genghis Khan Susukino Kosatenmae” Here you can enjoy a meal of Genghis Khan while experiencing a romantic night view. It is often used as a meeting place. 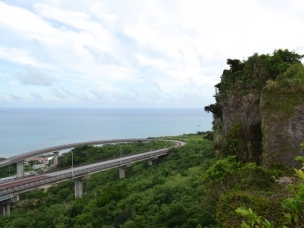 It is located on the 5th floor of a building facing the “Suzukino intersection” and where the famous Route 36 and the station front merge. It is the place to enjoy delicious raw lamb and mutton. This Genghis Khan store has abundant seating from small rises to couple seating! Their soft lighting highlights the shining night view of Susukino. In addition to a counter seating they have side by side seating with a partition, and private rooms. Everyone from groups, families, couples, and individuals will be able to find comfortable seating. Even first-time visitors will feel comfortable here! They Offer delicious plates of meat with carefully selected hand cuts! All the meat is selected carefully from the production area. It is prepared with simple ingredients that complement the deliciousness of the meat. 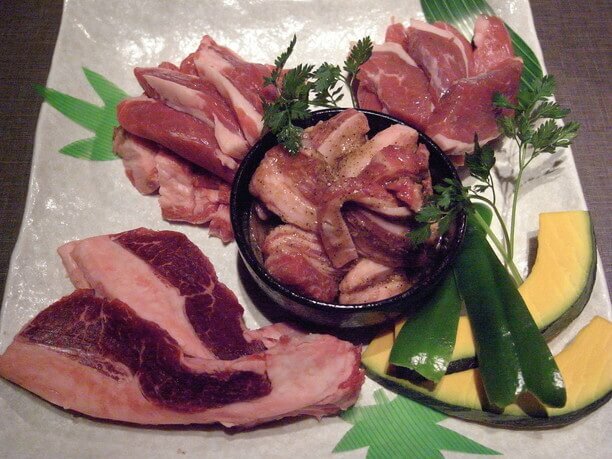 There are 4 types of meat in the popular “Yozonjin set.” There is Australian mutton roast, Australian lamb, raw lamb produced by contract farmers in Shibetsu City in Hokkaido, and saltweed Genghis Khan in the middle of the dish. There are so many types of meat to eat you might not know where to start! 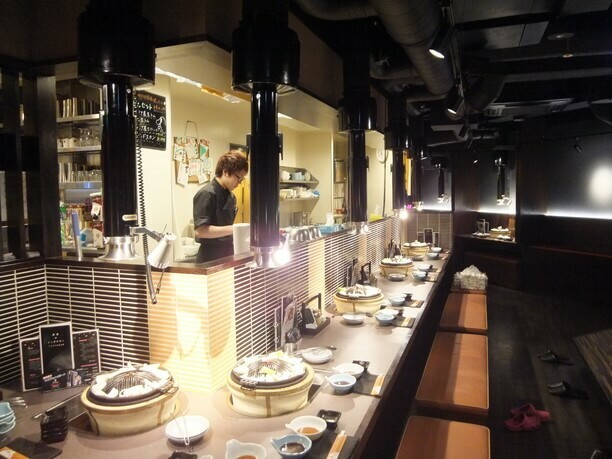 “It is recommended to order from the set menu because there are so many types of meat you can choose from.” Says Maekawa (前川社長)(the company president). The fragrant scent and sounds of the lamb meat cooking is very inviting! There is no particular order to cook the meat, but I recommend starting with the raw mutton roast then you can use the fat oil to cook the other meats in. Once cooked, you can put it on the outside of the plate to keep everything else warm. The Genghis Khan pot is unexpectedly functional! The mutton is meat taken from sheep over 1-year-old, lamb is less than 1-year-old sheep meat. Please check out the difference between the soft lamb and rich tasting mutton! The salted Genghis Kahn is pickled in the shop’s secret sauce. Even though it is thick cut it is still soft, and perfect with rice! It is delicately cooked with onions and other vegetables that are soaked in the deliciousness of the meat. It is a low-calorie lamb, abundant with essential amino acids. Choose from the original flavor or add salt for your favorite taste! 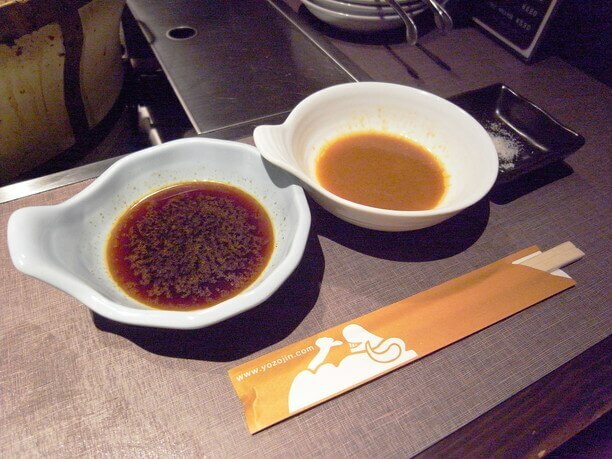 The restaurant’s Genghis Khan is served with two types of original sauce and herbal salt addition. It has a spicy miso base with a punch and rich flavor, and a refreshingly fruity soy sauce base that enhances the original taste of sliced raw lamb meat. Their lineup of herbal salts delicately adds sweetness and flavor to the meat. How about a high ball while looking at Nikka ‘s uncle? 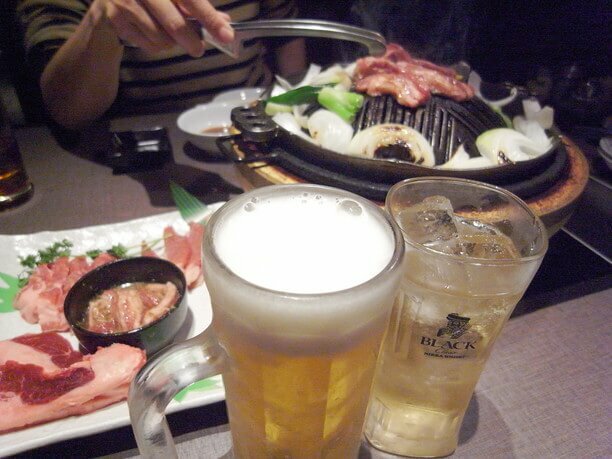 The Genghis Khan is very compatible with Sapporo Classic draft beer and Black Nikka from Nikka Whiskey. The dry taste of the alcohol makes it easier to eat a lot of meat! 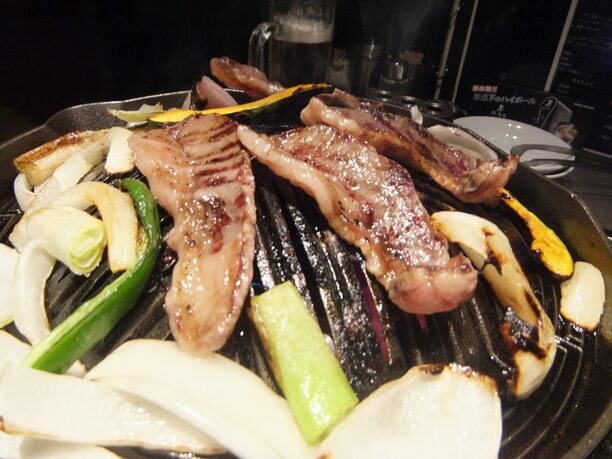 For those who want to eat plenty, there is also a raw lamb Genghis Khan and drinks course for 3800 yen. It is all-you-can-eat and drink in 90 minutes. It comes with soft, juicy Australian-made lamb, kimchi, vegetables and rice and all the Sapporo Classic you can drink! In the winter season, you can also enjoy a romantic Genghis Khan dinner while watching the sparkling winter night view of Susukino! You can compare the soft raw lamb meat and rich raw taste of the raw mutton roast. 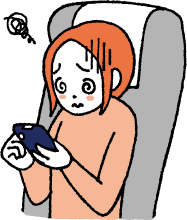 It is recommended that you make a reservation in advance. 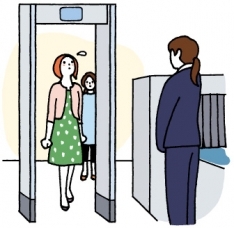 It is convenient even in the cold winter because it is directly above the Susukino Subway Station. It is recommended that you eat Genghis Kand while watching the beautiful night view of Neon lights. Their Miso sauce is unlike what you will find in other shops. It is entertaining to sit at the counter where you can see them cut and prepare the meat in the open kitchen. Matsuo Genghis Khan’s Matsujin Sapporo station branch serves an amazing Genghis Khan! 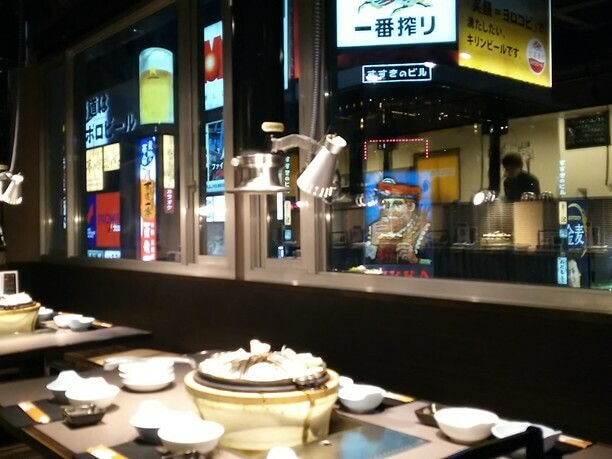 10 exquisite Genghis Khan restaurants in Sapporo from the famous to the not well known! Sapporo Genghis Khan Main Store uses soft hand – cut lamb! Itadakimasu has the best Genghis Khan!